The southeastern portion of Georgia borders the Atlantic Ocean. Less than 3% of the state (about 1,500 square miles) is covered by water. Major rivers include the Chattahoochee River, Savannah River, and Suwannee River. Major Lakes include Clark's Hill Lake, West Point Lake, and Lake Hartwell. What is Georgia's maritime history? Georgia has a rich maritime heritage. The state's rivers and tributaries form a complex network that Native Americans used for travel and trade. During the Colonial era, Georgian ports received an influx of immigrants and slaves. During the Revolutionary War, British ships seized merchant vessels in the port of Savannah during the Battle of the Rice Boats. In the antebellum years, Savannah continued to serve as the point between river and ocean traffic, primarily witnessing the shipments of cotton and slaves. During the Civil War, the Georgia coast saw blockades and blockade runners like the America, with shipping slowly returning during Reconstruction. Interestingly, the America's Cup is named for the America, which won the Royal Yacht Society regatta (precursor to the America's Cup) in Europe in 1851, more than a decade before becoming a blockade runner. The state took advantage of the steamship boom. Vessels carrying passengers and freight sailed between Savannah, New York, and Boston. The first steamship to cross the Atlantic Ocean departed from Georgia and was named Savannah. Underwater archeological investigations are ongoing in the state, but historical accounts indicate that there could be hundreds of sites. 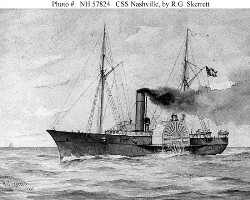 The state's website lists several shipwrecks and other underwater archeology sites important in the state's history, including the Civil War era CSS Nashville/Rattlesnake, the CSS Georgia, and the USS Water Witch. For more information on these vessels and their complex careers, please visit the Dictionary of American Naval Fighting Ships. Underwater historical sites in Georgia are not limited to shipwrecks. Submerged ruins of the late 18th to early 19th century tobacco river town of Petersburg lie in the waters of Bobby Brown State Park. Seventeen miles off the coast of Georgia there may be an underwater prehistoric site in Gray's Reef National Marine Sanctuary. Researchers believe that this area was above sea level 15,000 years ago on the coast and available for human settlement. Who takes care of Georgia's underwater archeological sites? The Department of Natural Resources is the custodian of all submerged cultural resources in the state. The Department has a State Archaeologist responsible for identifying and protecting archeological resources including submerged sites on state-owned property. The state of Georgia claims title to all submerged cultural resources within the state. Applications for permits are submitted to the Historical Preservation Division of the Department of Natural Resources for review and consideration by the State Archaeologist. If the Director of the Division and the State Archaeologist determine that the proposed activity is in the public interest and preserves and protects the submerged cultural resources, the Department of Natural Resources may issue a permit with or without holding a public hearing. Applicants must be a scientific or educational institution or an individual with sufficient financial resources to complete the operation. Applicants must further establish that the proposed operation advances archeological or historical knowledge, state-owned bottom waters will be restored or stabilized, and the cultural resources will be used in the state's best interest. At least one professional archeologist must be retained to oversee the project. What laws are there about underwater archeology in Georgia? Relevant Georgia statutes are codified at the Official Code of Georgia Annotated � 12-3-80, et seq. and � 12-3-50, et seq. Related regulations can be found at Rules and Regulations of the State of Georgia Chapter 391-5-9-.01, et seq. These laws and regulations stress the state's intent to further its obligation to promote and preserve the health, prosperity, and general welfare of its citizens, the state of Georgia encourages the preservation of sites which have historical, cultural, and archeological significance to the state.